When is the last time you had a dental checkup? 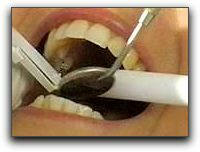 Most people between the ages of 25 and 85 need a dental checkup every six months. If you live in La Mesa or San Diego and are at higher risk for oral diseases, you should have your teeth checked every four months, or at least three times a year. Most people in the La Mesa and San Diego communities are in a medium to low risk category. However if you use tobacco or alcohol, eat a lot of sugar in your diet (including lots of soda), or have poor oral hygiene habits, you are likely in a higher risk category and should have your teeth checked right away. After receiving a dental checkup, your dentist may suggest further treatment by a cosmetic dentist for such things as halitosis. Your cosmetic dentist can also help you improve your smile with invisalign clear braces, porcelain veneers or tooth whitening. I look at a lot of factors to determine your personal dental hygiene and the best treatments for you to improve the look of your teeth for a dazzling smile. I want you to have the healthiest smile possible so that you can enjoy your teeth for many years without significant problems. If you live in the La Mesa or San Diego area and are ready to have your teeth checked, please give cosmetic dentist Jeff Gray DDS a call at 619-717-8560 or come into our office, located at 8555 Fletcher Parkway #102, La Mesa, CA, to make a dental appointment. You can visit our website at https://www.smilesandiego.com for more information.